Shipping costs for orders up to € 50 are € 3.95. For orders from € 50, - free shipping applies . Furniture transport free (up to the door, ground floor) with the exception of the Wadden Islands, this is on request. Shipping costs for orders up to € 50 are € 4.50. For orders from € 50, - free shipping applies. Furniture transport € 39.00 for Belgium and € 89.00 for Germany (up to the door, ground floor). Shipping costs are € 9.95 standard. Furniture transport € 99.00 (up to the door, ground floor). Shipping costs are € 9.95 standard. Furniture transport on request. * Many of our items are immediately available from stock and can therefore be delivered to your home the next day. Orders that you have placed on Saturday or Sunday will be sent to you on the following Tuesday. In the unlikely event that something can not be delivered the next day, we will of course inform you of this - provided the ordered article is not in stock. For furniture transport we can order the line "before 23.00 hours = tomorrow in the house!" do not handle it. For this, a delivery appointment will be made with you as soon as possible. Do you want to return something? That's no problem! The trial period is 30 days and starts on the next day after the package has been delivered to you. You can cancel within this period. After revocation you have another 14 days to return the items. The article should be returned in its original condition and packaging - if reasonably possible - (of course you can also hand it off at our collection location Heinenoord : Boonsweg 85, 3274 LH Heinenoord). The shipping costs for return shipment are for your own account. We advise you to keep the shipping receipt. Returns that are damaged due to improper packaging can be handled, but the costs are for you as a customer. Below you will find a return form with our return address. Fill in the form and paste it with the address on top of the box. You can download the return form here . You can also use the European standard form for withdrawal, but this is not mandatory. You can find this form here . When (one) furniture (s) is / are delivered via furniture transport and you want to return it, you can use a transport company selected by us for the return of furniture. The transport costs are € 39. For more information, please contact our customer service +31 (0) 180-615 101. As soon as we have received and checked the return, it will be settled further. You will receive a confirmation email from us if we have received the return. The purchase price (including any shipping costs) will be refunded as soon as possible, but no later than 14 days after cancellation. The processing time depends on the payment method you have chosen with which you paid for your order. We can wait with refund until we have received the goods back, or you have shown that you have returned the goods, whichever comes first. Do you place an order with stock and not in stock? When you place an order with in-stock and non-stock items, it may be that we want to meet you and already send the articles in stock - of course at our expense. This only applies to orders from € 100, -. All prices shown in the shopping cart include VAT. When you want to place an order, click on the button "complete order" at the shopping cart. If you have not finished ordering, you can continue shopping. The total order can be completed by returning to the shopping cart. Did you think of yourself? Then you can also easily remove the article from your shopping cart by clicking on the cross after the relevant article. To deliver the order correctly and quickly to you, we need your address details. 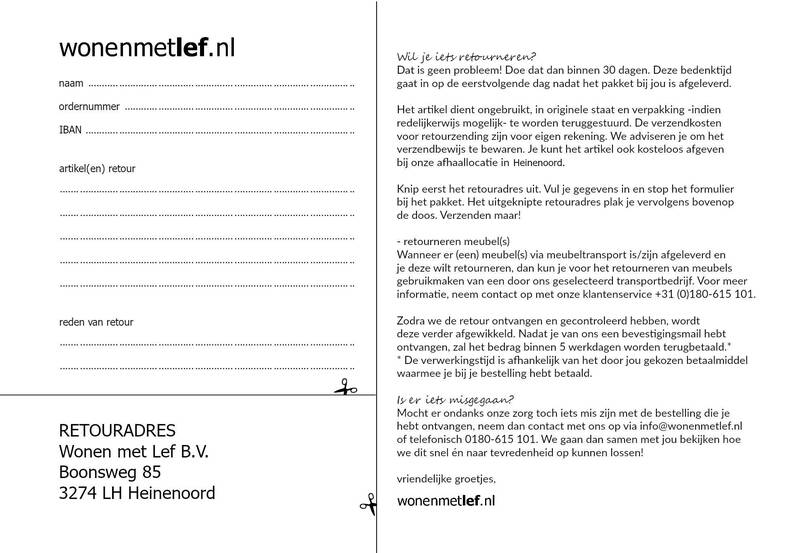 wonenmetlefkids.nl handles the information provided by you with the utmost confidentiality. Direct payment via iDeal, Credit Card Visa and Mastercard for a fast delivery. Indirect payment by bank transfer for delivery after receipt of payment (note, this is not a 24-hour delivery). In a clear overview you can see all your data in a row. You can now confirm your order definitively or make the latest changes.